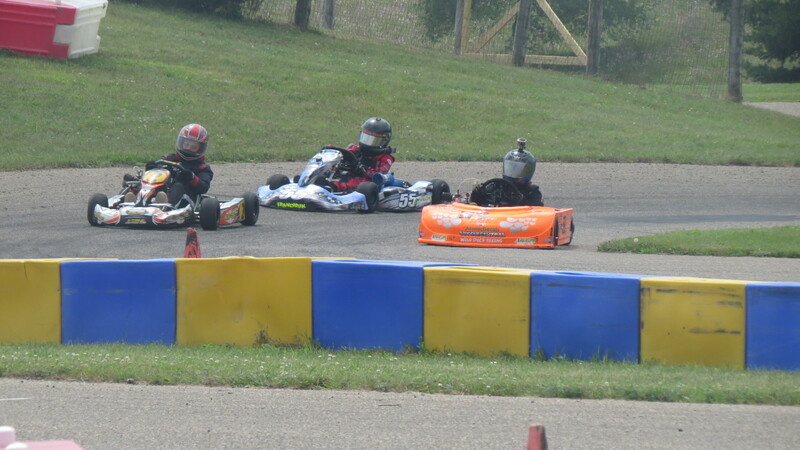 The second race weekend of the Briggs and Statton 206 Cup was held in at the Mid-West Karting Association in Eau Claire, WI on July 24th and 25th. Our trip started on with something new, a stop in Madison, WI and a stay at an AirBNB, the Uber of Bed and Breakfasts. Our lodgings where very nice and exactly suited to our simple needs, a place to rest our heads for a reasonable price, Thanks Dustin and Family, hope to visit you again. After our Thursday nights rest, we finished our drive to the track and set about to practicing and tuning Jason’s karts. Jason spent the first few laps puttering round on learning the track and then quickly picked up speed as he tested the track for the fast line. 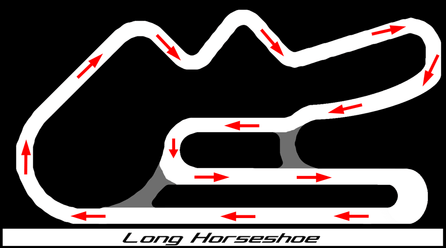 This tracks main challenge is a squiggle that runs down the back stretch. The entrance is out of a high speed sweeper and If you don’t set up the first kink correctly you loose more speed and time at each subsequent turns. At the exit then you have to setup an moderately sharp u-turn in to the rest of the infield. Getting that entrance wrong will blow the rest of the lap. While Jason was tuning his driving, I was turning the karts, making the subtle adjustments as he reported back. By the end of the day we were both hot and tried, but both karts where ready for racing. Saturday started with practice which went very smoothly but the racing was another matter. The LO206 had a drive chain fail and the Animal had a tire come apart during the heat races. I was able to replace the chain and the tire before the feature. Unfortunately the “new” chain also failed during the first lap on the LO206 feature. Both karts had well worn tires, as the day progressed karts got more difficult to drive through corners. Eventually, as the laps wound down the kart slid around corners like he was using his hard tires and the slower lap times reflected that. While, it was not our best day we learned some thing about these soft tires, when they go, they go. Despite the failing tires Jason set the fastest LO206 Sportsman lap of the weekend of 40.242, just needs to work on passing to get around the competition. That will come in time. He finished 3 third in both classes for the day. Sunday started with new tires for both karts and some more practice to break them in and bit of fine tuning. Like the racing at Badger it was very exciting, but not much actually happened. Jason and the other drivers in both classes where so closely matched now that they where nose to tail evey lap of every race. Each driver looking for or to make the opened needed to move up a position and no one giving ground. Jason was not able to make any progress in the LO206 the 4 races and finished 3rd for the day, but did set the days fastest laps. In the animal sportsman class race one Jason took and early lead and stretched the lead to a few seconds at the end of his first win of the weekend. The second race ended when the throttle cap came loose and he retired early. The feature was quite the battle between the three drivers, again where nose to tail as they raced around the track. At the end of the 11th lap Jason spotted an opening and made his move to take the second spot. Jason held on to the position for the last lap, finishing second in the race and for the day. The day ended with 3rd in the LO206 class and second in the Animal class. Can’t wait for these guys to meet at Concept Haulers Motor Speedway, Jason’s home track, for the next 206 Cup race. This next weekend we will be at the 3rd Championship Endro Series race and second visit to Blackhawk Farms, in South Beliot, IL. This should be a fun but relaxing weekend with our racing friends. Thanks Neil and Christian for their company and competition in both the sportsman classes. Congratulations to Regan and Jen on your first born and thanks for the great motors from 4 Cycle Central. Karen, we have a trailer now and it work mostly, thanks for the trust. Kate nice working earning all of those ribbon at the Lake County Fair, 5 Grand Champions and 2 Reserve Champions.